Rugged, Waterproof and Powerful. 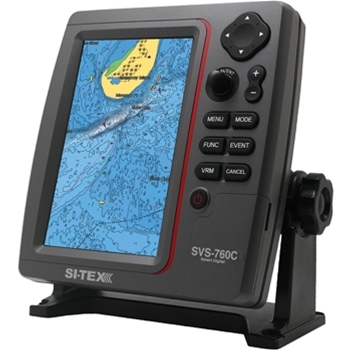 The Sitex SVS-760C fits the bill when anglers or cruisers are searching for a high end Chartplotter without the high end price tag. A bright 7" vertical LCD Color Display that is viewable even in direct sunlight will clearly display detailed navigational maps while the 50 channel external GPS quickly and accurately locks into position. Mark up to 20,000 waypoints, 100 routes and 50,000 track points and easily access them at a later date. A simple user interface and menu set-up makes this a perfect addition for any recreational or commercial fisherman. Each 760C comes with: SVS-760C, Mounting Bracket With Knobs, Power Cable, External Antenna, Navionics Gold Chart, User Manual and A Two-Year Warranty. Stores 20,000 Waypoints, 100 Routes, 50,000 Track Points. Compatible With C-MAP Max And Navionics Gold Charts.